90 millions years ago the nature was already at work for giving us the chance of a wonderful hiking experience in the landscape of sandstone rock “towns”, towers, walls, gorges and ravines . We start our hike at Tisa Rocks, a well-known group of sandstone rocks. Chronicles of Narnia movie has been filmed here and it is not by chance! The natural labyrinth between is amazing and the views from the top of the rocks too. 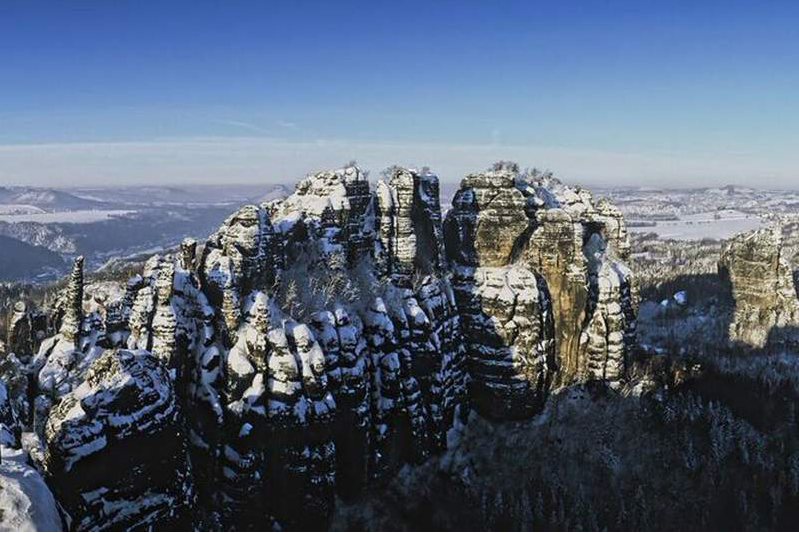 After Tisa we will move to Děčínský Sněžník, the only table top mountain in the country and also the highest peak in the Elbe Sandstone Mountains ((722.8 m above sea level). The view from the top it is something that every Czech wants to see once in life. After a nice lunch at the local restaurant we will continue our journey and get to the city of Decin, the gate to Elbe Canyon. 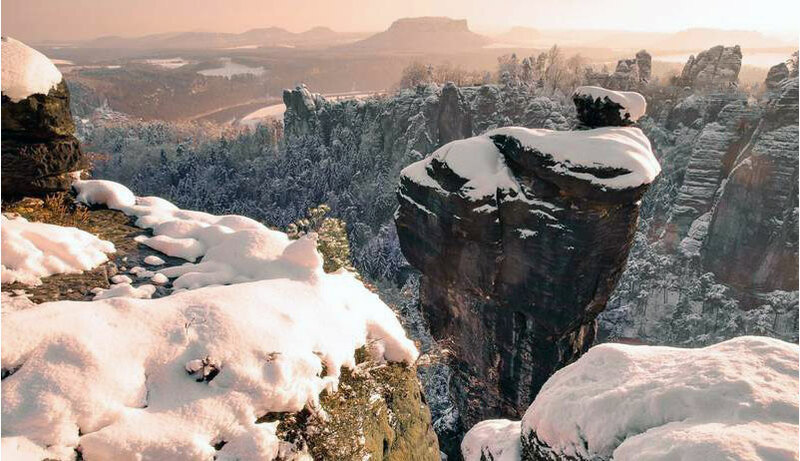 There we will have our third hike of the day that will take us on a natural rock balcony with a view over the Elbe river, a great way to finish our epic tour in the Bohemian Switzerland. 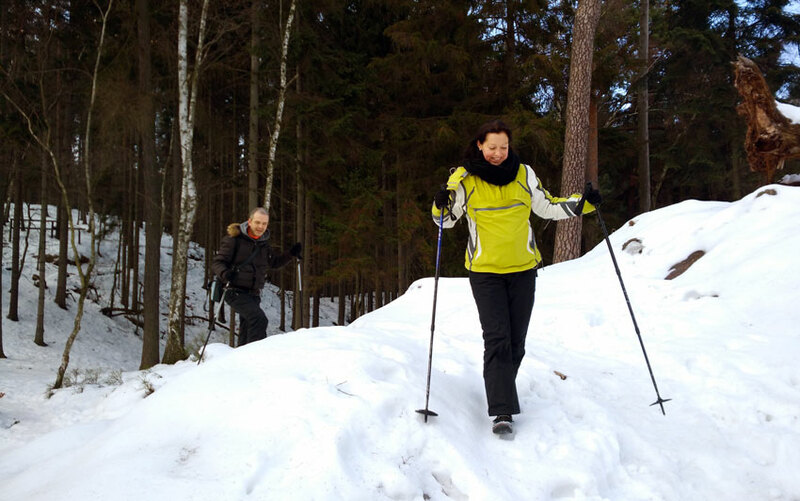 This hiking runs from November to March. Meeting point is your accommodation or if we cannot get there by car, we will give you a close meeting point. We pick you up from 7 to 8 am, depending on your location and other participants’ locations. The tour will end also at your accommodation. 5 stars tour… Amazing! Best day of my entire holiday with you! This trip was definitely the highlight of our two week experience in Prague. We have hiked around the world and this area ranks up there as being one the the most spectacular. Don’t miss this one! *”Group tour” means that other people might join, max 8 people in total.